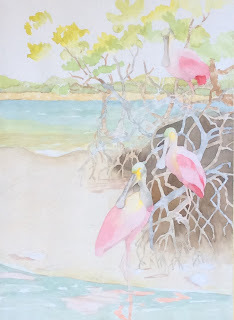 I am very excited to announce that, I have received a commission from a collector that is new to the Palm Beaches. She is decorating her home and has some pieces of art in an entrance area that are basically pink. In her living area (which is connected to the entrance) is a salmon colored chair that she adores. She wants to keep both items so,I'm going to create two paintings that use both colors which will bring all the pieces together. She also loves birds. 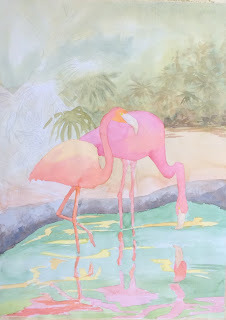 One painting will be of 2 flamingos (one pink and one salmon) They do come in both colors. The other painting will be Roseate Spoonbills. They are strangely beautiful birds a little smaller than flamingos and they are also pink. I'll tell the story of how we met in a future blog. Here are pictures of the first washes of color on the 30 x 22 inch paintings. I will add images of the paintings as they progress.